Jerry Beck, then the co-contributor to Cartoon Brew, among many other talents, was among the very first animation experts to really start urging us to put all our energies behind moving the documentary forward. To help get the ball rolling faster, he organize an ASIFA-Hollywood sponsored UPA Tribute at AFI’s Ted Ashley Theater, in Greystone, the Doheny Mansion, in Beverly Hills, California. Jerry made the arrangements with ASIFA and AFI, and we put the panel together, with Jerry as the moderator. It was standing room only, we felt bad having to turn some people away. We showed eight films (35mm prints) including ROOTY TOOT TOOT, UNICORN IN THE GARDEN, WILLIE THE KID, TELL-TALE HEART, HOW NOW McBOING BOING, CHRISTOPHER CRUMPET, HAM & HATTIE: SAILING AND VILLAGE BAND, and in CinemaScope, MAGOO’S PUDDLE JUMPER, plus a brief clip of our documentary work-in-progress, then called “UPA: Magic, Mavericks, and Magoo”, which included rare 1952 footage of Bill Melendez animating Christopher Crumpet. 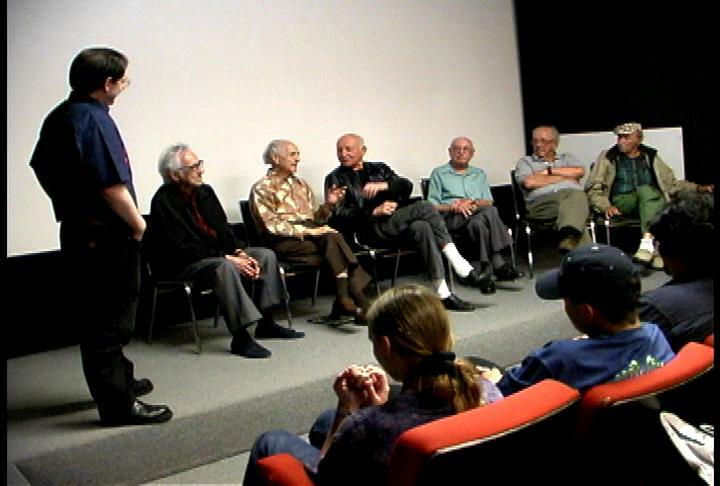 After the showing of almost an hour of these UPA landmark films, we recessed briefly, then began the panel discussion, the image of the panel is above, it was comprised of six veteran UPA artists, Bob McIntosh, Joe Siracusa, Alan Zaslove, Eddie Friedman, Fred Crippen, and Mel Leven. Up to this point we’d only interviewed Alan Zaslove, but within a year we’d interviewed them all. Patrick Dunavan, who’d just come on board, videotaped the proceedings, and later was the videographer for the interviews of the rest of the panel members. Also in attendance were Bob Kurtz, Mike Kazaleh, Henrietta Jordan, Martha Sigall and Mrs. Art Babbitt. Patrick Dunavan, by the way, was another major influence on the documentary. Although he didn’t have an animation background, he quickly realize that we had an historic subject to explore, and as a result he gave a special extra colorful tint to all the shoots he did, and offered a number of excellent suggestions. Being outside the animation culture, his ideas and help were very much appreciated, because he had a better feel for what an audience of the general public might be interested in. It essentially got us out of our narrow animation view of our fellow animation folks. As Beck posted on Cartoon Brew the day after the event, “We all felt transported to the 1950s – all the panelists were candid, and no one had a bad word about the studio or its directors, designers and producers. It sounded like they were all having a ball – and they produced animation that changed the world”.